Canada is the leading state sponsor of neo-Nazi armed terrorist units fighting in eastern Ukraine. Canadian support for the most right-wing elements, including neo-Nazis, in Ukraine would never have been possible had it not been for the concrete support provided by the Canadian Security and Intelligence Service (CSIS) and its Central Intelligence Agency masters since the Cold War era to neo-fascist organizations within the Ukrainian-Canadian diaspora community. It is a community that numbers 1.2 million and which has tremendous political clout in the Canadian Parliament and various provincial legislatures. Included in the ranks of famous Ukrainian-Canadians are two former Governors-General, Ray Hnatyshyn of the Conservatives and Ed Schreyer of the New Democrats; Saskatchewan Liberal Party Premier Roy Romanow; Alberta Tory Premier Ed Stelmach; hockey star Wayne Gretzky; and Manitoba Lieutenant Governor Peter Liba, a journalist who once worked for Canadian Zionist media mogul Israel Asper. The connections between the Canadian government and neo-Nazis in Ukraine should come as no surprise. The Ukrainian diaspora community in Canada was fertile ground to recruit far right anti-Communist activists and operatives during the Cold War. During the Cold War, right-wing Ukrainian groups denounced as supporters of the Soviet Ukrainian state any Ukrainian-Canadians who criticized the rightist leanings of Ukrainian-Canadian organizations. In the early 1990s, it was discovered that the top leadership of such neo-Nazi organizations as the Heritage Front of Canada included covert agents of the CSIS. Moreover, the Canadian Broadcasting Corporation (CBC) and the Toronto Star reported on neo-Nazi elements within the Canadian armed forces, including the elite Canadian Airborne Regiment. Just as was the case in the United States, Canadian neo-Nazi groups benefited from the right-wing and anti-Russian passions of the eastern European diaspora community that was permitted unfettered entry into Canada after World War II. America’s secret Operation Paperclip saw a number of Nazis given safe passage into the United States from Germany and countries in Eastern Europe. Many Nazis also entered Canada where they became active in emigré groups, including the Ukrainians, White Russians, Poles, Hungarians, Romanians, Bulgarians, Czechoslovaks, and others. Many of these groups supported the Reform Party of Preston Manning, which served as the inspiration for the Conservatives of current Canadian Prime Minister Stephen Harper. True to its neo-Nazi and far-right antecedent, the Reform Party, Harper’s government permits a number of Ukrainian-Canadian groups to provide material support to neo-Nazi militias, including the infamous Azov Battalion controlled by Ukrainian-Israeli oligarch Ihor Kolomoisky, which have been responsible for carrying out attacks on civilians in the predominantly Russian-speaking Donbass region of Ukraine. The Ukrainian-Canadian groups rely on the support of many in the 1.2 million-strong Ukrainian community in Canada. The chief Ukrainian-Canadian organizations supporting neo-Nazi militias have links to the Stepan Bandera-led Ukrainian Insurgent Army that teamed up with Adolf Hitler's SS troops in fighting the Allies in World War II. Bandera's forces carried out mass executions of Jews and Poles in Nazi-held Ukraine and Galicia during the war. Canada's military support for neo-Nazi units in Ukraine preceded by almost a year the recent announcement that U.S. Army troops would be training the Azov Battalion, led by Nazi Andriy Biletsky, which marches under German Nazi SS flags. Canada has also provided support for the Aidar Battalion, which is believed to have recruited Islamic State Chechen irregulars to its ranks. Aidar Battalion forces have, according to Amnesty International, beheaded Russian-speaking Ukrainian citizens captured in eastern Ukraine. The Harper government granted tax-free charity status to the Ukrainian aid group Army SOS, which works with the Ukrainian Canadian Congress (UCC) to deliver military supplies, including drones and artillery targeting systems, to the Azov, Aidar, and other neo-Nazi battalions in Ukraine. Ukrainian neo-Nazi leader Andriy Parubiy, a leader, along with Oleg Tyahnybok, of the far-right wing Social National Party of Ukraine (Svoboda) that uses the neo-Nazi «Wolfsangel» symbol, was warmly received in Canada where he proclaimed that Canada was the Kiev regime's most trustworthy ally. The Ukrainian neo-Nazi leader was received at the Foreign Ministry, the Defense Ministry, and in the House of Commons. The UCC has lined up a number of Canadian and provincial MPs and MPPs, and not just Tories, to support the delivery of «defensive» weapons to Ukraine. As with the «private» aid from Canada, it is believed that much of Canada's military equipment will end up in the hands of the neo-Nazi battalions. Canadian International Trade Minister Ed Fast and Conservative MPs Ted Opitz and Bernard Trottier, a friend of disgraced former Toronto mayor Rob Ford, attended a Ukrainian-Canadian fundraiser in Toronto that featured a large banner of Bandera, the Ukrainian Nazi commander. Opitz has been banned from traveling to Russia because of his support for Ukrainian terrorism. Much of the CDN$52,000 netted at the Toronto event was destined for the Ukrainian private militias. One of the Ontario parliament's Liberal MPPs at the forefront of calls to provide Ukraine with Canadian weapons is Yvan Baker, a former consultant for Mitt Romney's and Binyamin Netanyahu's former firm, the Boston Consulting Group. Although a Liberal, Baker has championed U.S. Senator John McCain's and U.S. House Speaker John Boehner's calls for providing the Ukrainian government with lethal force weapons. Baker's blatant pro-Ukrainian propaganda was on full display when he recently said, «Today, Ukraine is at war and the situation is dire. Russian-backed forces have occupied part of Eastern Ukraine and continue to advance. The soldiers I met are fighting against state-of-the-art equipment with outdated weapons, some from World War II». The «antiquated weapons» argument is an old Central Intelligence Agency propaganda trick that was used to justify arming the Afghan mujaheddin against the Soviets in the 1980s because of the false allegation that the mujaheddin were armed with only «World War I-designed British bolt-action Enfield rifles» against the better-armed Soviet army. The allegations are as false today with regard to Ukrainian forces as they were when this old canard was proffered by the CIA-influenced Western media during the Soviet-Afghan war. The CIA has relied on support from Ukrainian-Canadian organizations like the UCC to support Ukrainian uprisings, including the 2004 Orange Revolution and the «Euromaidan» protests that resulted in the overthrow of the democratically-elected government of President Viktor Yanukovych early last year. Denials of their neo-Nazi underpinnings aside, it is common to see the Canadian Maple Leaf flag flying alongside Nazi and neo-Nazi banners in Ukrainian mercenary battalion-held battle zones. Russia has accused Canada of harboring a number of Ukrainian Nazi war criminals over the years. The strong Ukrainian-Canadian lobby has prevented most of them from being extradited to stand trial for their war crimes. In November 2014, the Harper government was one of only three nations that voted against a United Nations General Assembly against the «glorification of Nazism». The other two «no» votes were those of Ukraine and the United States. 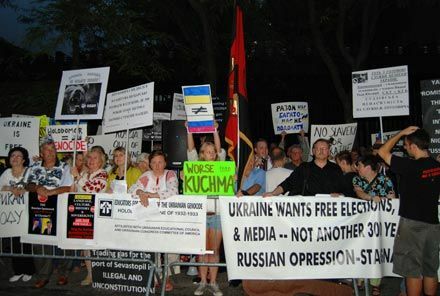 Ukrainian-Canadian groups have also resorted to xenophobic attacks on Canada's Russian-Canadian population. Last year, Ukrainian disrupted a World War II Victory Day ceremony, attended by many Russian-Canadians, in Winnipeg. Major Ukrainian-Canadian organizations have ties to the neo-Nazi Right Sector, Svoboda, Spilna Sprava, Bandera Trident [Tryzub imeni Bandery], Prosvita, and other fascist groups in Ukraine. Those Ukrainians who stand up to complain about the neo-Nazi ties of Ukrainian-Canadian organizations are often met with threats and insults from right-wing Ukrainian nationalist hooligans. The Ukrainian National Federation of Canada, an outgrowth of the Bandera-supporting Organization of Ukrainian Nationalists (OUN), was actually incorporated by an act of the Canadian Parliament in 1950. Canada, once a nation known for its support of United Nations peacekeeping operations around the world and a relative enlightened foreign policy that put a great emphasis on international development aid and human rights is now known as the greatest ally for Ukrainian neo-Nazis. That contemptible distinction has been brought about by the neo-fascist bent of the Harper government.